Wow, 2 years!! We remember 2 years ago on Saturday, December 18th we were having what seemed to be normal day to us! Emily was 3 1/2, Jessie had turned 9 in October and Brianna had just turned 1 at the end of September! Doug had gone to the get a ton a pellets for the pellet stove that day and pulled the trailer around back the house! We were just hanging out by the fire and enjoying the warmth and our family! Emily had complained that her stomach hurt, so we thought she may have to go to the bathroom, she tried but wasn't able to go. A little while later she was still complaining her stomach hurt, but she also had a fever accompanied with the tummy pain of 101! We called the oncall pediatrician and she said that a tummy bug had been going around, try to give her Tylenol for the fever and see what happens in an hour! The hour went by and instead of her fever going down, it went up! So we called the pediatrician again and she said bring Emily to the ER to see what was going on! We left Jessie and Brianna home with family and Doug and I brought Emily to the ER! What we didn't realize on the way there or even there for a few hours before a CT scan was done, that it was going to be a long night and a long journey ahead of ourselves! What we heard at almost 6am in the morning, is something that we never expected to hear after being there for almost 5 hours! We were all exhausted, Emily was asleep on the ER bed with me beside her asleep and Doug asleep in the chair beside the bed! The doctor walked in and pulled up a chair along bedside and we woke up! She said, "Mr and Mrs Hubbel, your daughter has a tumor!" At this point, we were sent to VCU medical center by ambulance with daddy following behind, and having to call Jessie's dad to come and get her and for family to come to the hospital! After this everything seems really fuzzy, and blurry and what everyone said and why we were at VCU and why things were happening! It was really a blurry time!!! Today 2 years ago today, we learned Emily had a tumor in her right adrenal gland in her stomach! We didn't know if it was cancer, we didn't know if it was metastasized, we didn't know the word "Neuroblastoma" ! We didn't know anything! I must tell you all something, while we knew that children could get cancer, we certainly were very naive to the fact! (what I am about to tell you, I did talk with Rachel about and tell her) I was on a local mommy board prior to December 18th and had been for a while! I remember following a mom by the name of Rachel and Roger (dad) whose daughter, Charlotte had brain cancer! 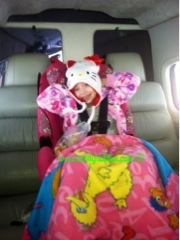 Rachel was also living a normal life until her daughter was diagnosed! I silently read their journey and had a hard time understanding that this could happen to a child! Until it came down to Rachel and Roger had no other options after traveling all over the world to help her and beautiful Charlotte passed from a childhood cancer. I remember reading it when she passed and was laying in the bed with Doug and I was crying, and he asked what was going on. I told him and he said, "I couldn't imagine!" I see butterflies and I think of Charlotte...while I never met sweet Charlotte, she was a beautiful little girl who loved to be read to! So all of your parents of your beautiful children, ask yourselves, have you said this? Have you said, "I cant imagine!" and try to block it out and move on wiht your life? I know that while even though I read Charlotte's journey and I was silent, I said this too! To this day, I wish we were more aware and that many other parents, teachers, aunts and uncles and everyone else was more aware of childhood cancer! Please don't be naive like we were, please be aware! 2 years ago today, our lives changed forever, never will Emily, Jessie and Brianna and Doug and I have what we thought was "normal"! We learn to live a "new normal" and take things one day at a time and learn from there! On December 23rd, after surgery (biopsy), many scans, lots of IV's we learned that Emily was diagnosed with Stage IV Neuroblastoma (high risk)! Neuroblastoma was such a foreign word then, and now I hate everything about that word and other types of childhood cancer. We know things now that I wish we and no other parents had to learn. We know about CBC's, chemo and types of chemo, MIBG scans, MRI, CT's, PET scans, blood draws, needing blood product transfusions to continue to live and ports and so many other things! Mommy had to learn to be a nurse to take care of Emily's line on a daily base, learn to change dresses for her port, give shots and give medicine upon medicine to our little girl. Mommy also be a momcologist, and daddy a dadcologist! Things I never thought we would be doing! I thought we would have normal well check ups at the doctors, doing dance and all these other things. So, today Emily and I are on a plane to Grand Rapids, Michigan. Daddy and Brianna are driving because we learned at 840 am this morning our pilot to take us back, was really unsure with the weather because they are calling for freezing rain and then snow Friday! Wings of Mercy is one amazing organization that has really made it possible for us to get back and forth from Virginia to Michigan and we are very thankful for all of the kind pilots that take time out of their day for us and many other families!! but eith the weather Possibly not being safe conditions for flying, we decided to instead of not knowing when we would be home because (Christmas is in a week and we want our family home together) that Emily and I would fly so we don't miss her appointments today and daddy and Brianna would drive and we will see them tonight. It is definitely weird to be on this plan (on the 2 year mark) without Doug but we also want to do what is safe and best for our family. Originally we were to meet with Dr Sholler tomorrow after scans, but she had something come up, so we will meet her early Thursday morning now! This journey has taught us that a protocol, plans can drop just like that and you just have to take it and roll with it!! Anxiety is extremely high and continues to just get higher as we get closer to the scans! This is our big to us, being that Emily hasn't been in chemo in almost 3 months and she is doing the antibodies trial that is compassionate use! These scans really will tell us how things may look and if she will get to continue the trial or what! I don't want to think negative, but with this disease you just never know, you learn that every child is different! But honestly for Christmas daddy and I wish to see our little girl be clear, with no disease!!! It would be the best Christmas present ever! Please we ask that you send your good thoughts, your love and whatever you do!! Thank you! Sending good vibes, good thoughts and lots of prayers for super good news! Anyway - keep fighting Emily -- we are hoping things go well for you! It has been a long, hard journey and you have braved through it and learned a lot. My husband is a physician so I am aware of all the 'ick' out there and it is so sad and just wrong. Praying and praying for NED! Keep looking up at Jesus and bang on Father's door, I'm banging with you.